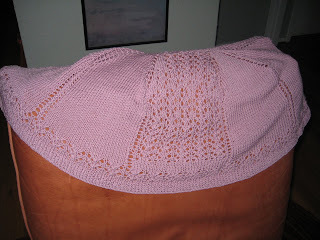 I knitted this shawl for Christina. It's the Summer Shawlette by Sandi Wiseheart. I think it's a cute pattern, but I made mistakes in it. I ripped back the lace several times with the result that there was still a discontinuity in the pattern at the shoulders - but better than my previous version. Christina asked for an "office" shawl, to wear at home, at her desk, which is why I still sent it off (in case you are wondering what sort of a crap friend sends a rubbish knitted item to her friend). I thought the pattern was not very clear at many points, and I just plain didn't like some of the transitions in the pattern. Because of this I think a plain version might be more successful as the shaping is really nice. 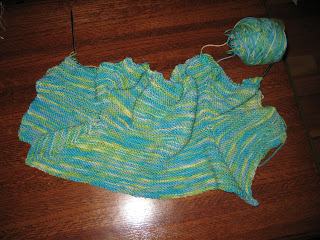 The yarn is Rowan 4-ply soft in colour 378 and I used 2 balls. If the mistakes are really too much for Christina to consider wearing this I can re-knit it with the other 2 balls in my stash as a plain shawl! Hope you have a lovely birthday, dear friend! 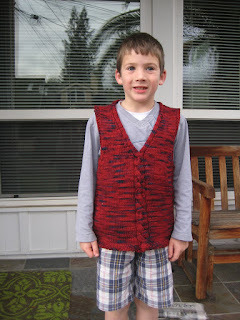 I finished Adam's vest. This is my own improvised design, but based heavily on the Noro vest I made for myself, which in turn was based on the Rowan Summer Tweed pattern: Rosemary. The yarn is Cascade 220 Paints in Colour 9926. Its left over from the yarn I bought for Nigel's Retrofit jacket. 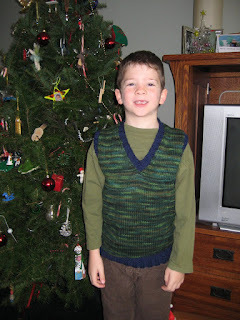 I used about 3 skeins for this vest. I knitted it on 5mm needles and it's based on a 60 stitch cast-on with a single 8 stitch cable up the front. I extended the cable around the back of the neck for a neater finish. 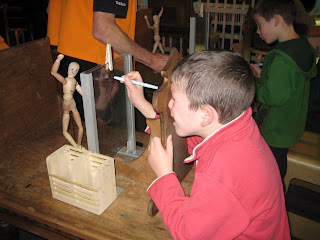 Nigel was busy this last weekend, so the boys and I had a crafty weekend. We got a head start on the valentine cards. Each class has a valentine card exchange, for which the etiquette is to send a card to every child in the class. 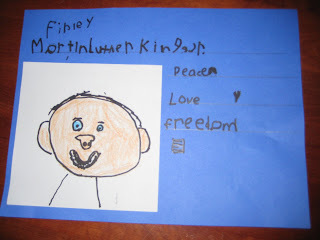 Home-made cards are encouraged. This of course means that the frazzled parent has to assist with the creation of 20 cards, usually the night before the party. This year I thought we would get going early. The boys decided on a magic theme to thier cards and wanted to put a moon and a wand accompanied by the message "You're Magic". 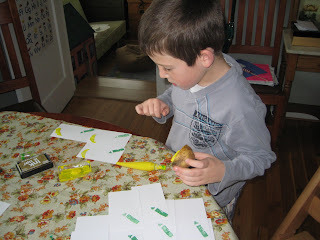 We made the cards using potato prints and a canibalized purchased stamp for 'wand sparks'. It was a lot of fun! 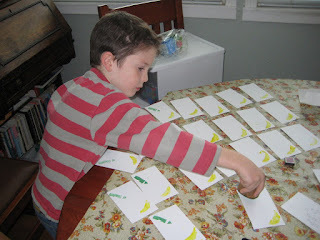 We discussed production lines as Finlay was commenting on how efficiently we were making the cards. 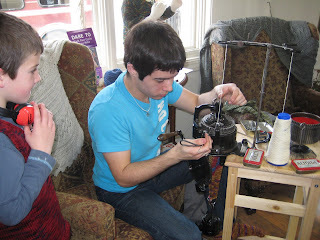 On Sunday we went to Green Planet Yarns where Tyler was demonstrating his antique sock knitting machine. 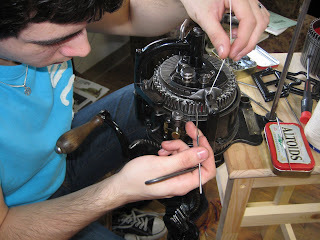 It's about 100 years old and he restored it to operation. It was fascinating and Tyler did a great job of explaining how it worked. The boys paid attention, but didn't seem that interested - until they were telling Nigel all about it later when I realized how much they had absorbed. They think I need one so I can make socks quicker! It seems even more significant to celebrate the life and work of Dr King this year, when the following day sees the inauguration of the country's first African American president. Extreme knitting...or knitting for extremities? I finished a couple of small projects this week, and finally took photos of some others. 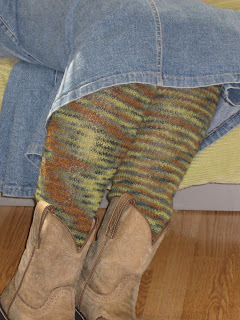 The week I finished the legwarmers (during a 3-day teleconference). They came out pretty nicely, but I have discovered a couple of things about alpaca: it has no stretch, and I am allergic to it! 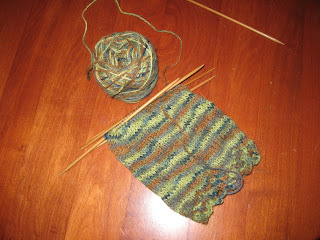 The pattern is the legwarmers from Leigh Radford's 'One Skein' and the yarn is Alpaca Sox. I knitted these at a looser tension than you would for socks, but I cannot imagine that these would make good socks. The rib and lace portions of the legwarmer immediately stretched out so the legwarmers drooped. The pattern calls for ribbon around the tops if you do not want a slouchy look. I also knitted a quick hat for Nigel. I used Christina's free pattern. The wool is Lang Tweed which I bought last year in Murphys. I was disappointed on our last trip to see that the wool shop is gone. 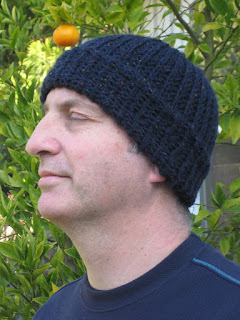 The hat took 2 balls and the fisherman's rib gives a light squishy fabric. The double band makes it a warm hat - but since the temperature here has been 75 degrees this weekend - there has not yet been any opportunity to wear it. 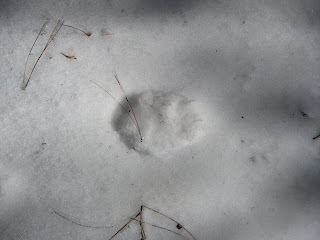 This item, however, has already seen heavy duty in a Sierra snowstorm. 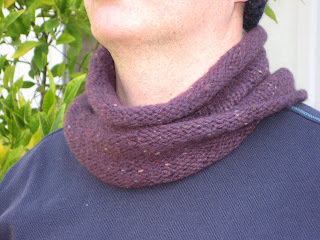 I bought a skein of Classic Elite Stormy, a cashmere tweed yarn, to knit a neckwarmer for Nigel for Christmas. I had such problems with the pattern I had chosen that in the end I just gave up and knitted a plain tube. The tweedy yarn however looks pretty nice just in stockinette. Nigel wore it in our trip to Bear Valley and confirmed that it was warm and toasty. A bit late with the knitting round-up. Apparently 2008 was a productive year, especially for sweaters for me. I have churned out 3 pairs of mittens, 2 scarves, and 2 neckwarmers, 14 pairs of socks, 3 pairs of slippers, and 5 hats. 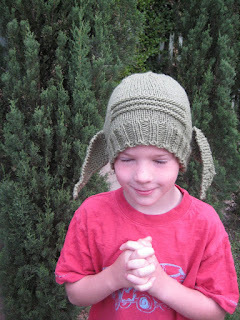 Special mention has to go to the 3 yoda hats I knitted from my own pattern. Incidentally I get a disproportionate amount of traffic to the blog from people searching for knitted yoda hats. Who knew? 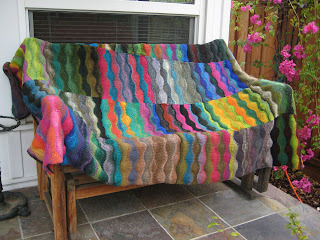 My favourite finished item of 2008 has to be my Lizard Ridge blanket. It's also the largest item I have ever knitted. Its firmly esconced in my living room where the boys snuggle under it in the early hours of the morning when they get up and make a bee-line to the cartoon channel! I don't think I actually spend much time knitting - I'm quite a quick knitter - but basically I only knit when I am already doing something else; like watching TV or listening to phone calls. I guess the truth must be that I watch an awful lot of television! ...legwarmers. I am making these because my new boots are too close fitting to wear my handknit socks, and I thought the legwarmers would do the same job keeping my legs warm (fancy that!). These are knitted in Alpaca Sox using the pattern in Leigh Radford's 'One Skein'. Any guesses what this item is? freeform knitting? seaweed? It's actually a baby jacket. The pattern is Elizabeth Zimmerman's Baby Surprise Jacket. 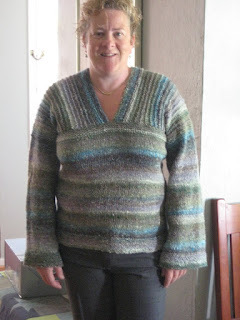 The surprise element being that while you are knitting it, it looks nothing like a jacket, so at the end you are (hopefully) suprised by the wearable garment you have created. The yarn is Cascade 220 Superwash Paints. Both yarns bought at the Commuknity closing sale. I have been meaning to make these felted clogs for a while. 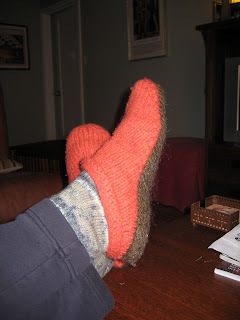 I knitted them up well before Christmas, but only recently got around to felting them. The orange is Cascade 220 Quatro that I bought in the Rug and Yarn hut closing sale. The soles are left-over Brown Sheep. The grey slippers are cascade 220 left over from my Loppem cardi, with the red trim being cascade 220 left over from the Christmas stockings (2 years ago). The orange were intended for me, but my front loader washing machine usually requires things to run through twice before they shrink to the idea size. Because I knitted these on smaller needles than the pattern calls for (because I could not find my 11mm needles) I just tried one wash cycle. While the slippers were drying they were snaffled...and fit Nigel just fine. Adam's slippers came out a good size after one cycle. I made patterns on the soles with fabric paint for better traction. 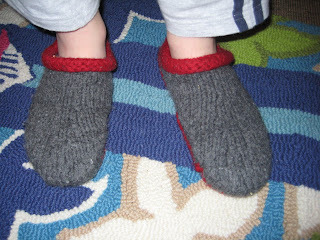 As soon as Adam was wearing his new slippers I immediately received a request for some from Finlay (although he has slippers that fit at the moment - so I have a little breathing room), and of course I have to still knit some for myself. 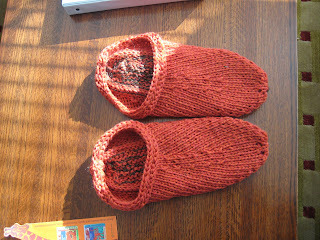 Edited to add that the pattern is Bev Galeskas' Felted Clogs. 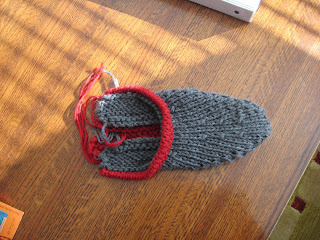 There are separate patterns for the adult and child sizes - so I used both versions for these slippers. I knitted adult medium in the orange, and child medium in the grey. 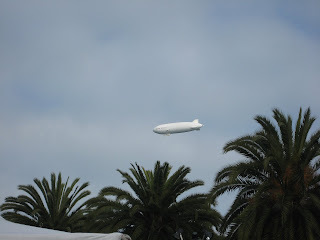 Turns out it is a real life zeppelin. It is apparently filled with helium rather than hydrogen like the Hindenburg, and is moored at Moffat Field. I was quite pleased that they were actually using those old airship hangars as at one point (and maybe still) the old hangar was in danger of demolition. Guess where we spent the last few days of our vacation? 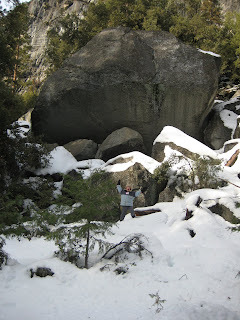 Nigel and I spent our Honeymoon in Yosemite 10 years ago. While we were there we promised ourselves that for our 10th anniversary we would go back to the Awahanee and stay in one of their cottages. I think at that time we did not anticipate making our anniversary trip with 2 boys in tow - but as it turned out we all had a fabulous time. 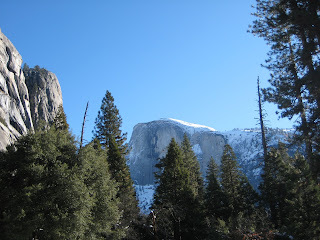 We arrived in pouring rain, but it cleared up and we were rewarded by a couple of beautiful sunny days. 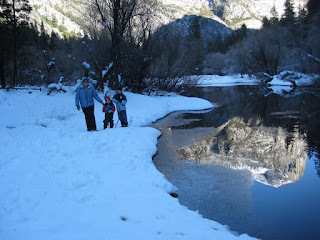 It was cold, and there was a lot of snow on the ground, and trails were icy, but the boys loved playing in the snow, skating on the frozen river, and climbing any rock they could find. I think there was more water running in the park than I have ever seen, and the waterfalls were beautiful. We also walked around to Mirror Lake and admired the reflections in the lake's surface. You can clearly see the claw marks in the print. 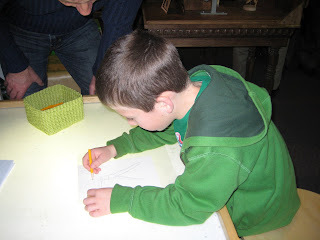 Finlay carefully drew all the prints we saw into his journal and laboriously labeled them. We had not been to Yosemite for 2 years are realized how much easier it is to travel with 6 and 8 year-olds rather than babies and toddlers. 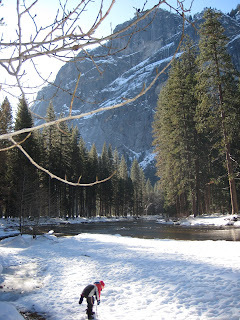 I forsee more trips to Yosemite in our future. As part of our vacation we received a request for a "chill out day". 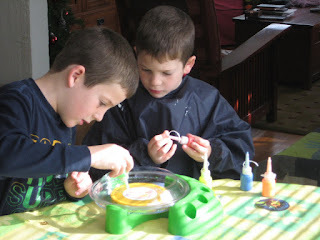 The boys received some crafty gifts and so we put them to use. Finlay received a Swirl Master set: this is basically a battery operated spinning wheel onto which you mount cardboard, then drop paint onto the spinning surface. It was very entertaining and produced a variety of (messy) paint effects. 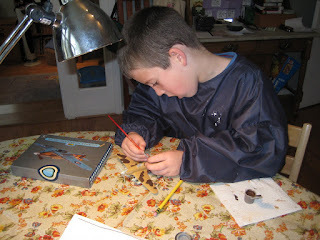 Adam received a Revell model kit of a Hurricane and decided that he was able to build and paint it himself. It worked out pretty well and took him almost all day to finish. When it's dry he wants to hang it on his bedroom ceiling along with all his big lego models. Tip for tall visitors to our house: be careful when walking around Adam's room! I also did a little crafting as I finished Finlay's vest. He requested this when we went to Purlescence yarns in Sunnyvale to buy wool for Nigel's retrofit jacket. There was a green vest on display and F asked if I could make him one. Here it is, exactly as requested. It's my own pattern knitted in Cascade 220 paints, which I bought in Purlescence at the time, and Cascade 220 Heathers in blue that came from Yarndogs and which was intended for slippers. He was very pleased with it, however I'm not sure how sensible it was knitting something for Finlay out of handwash-only yarn!! We headed back to San Francisco to the Embarcadero skating rink. 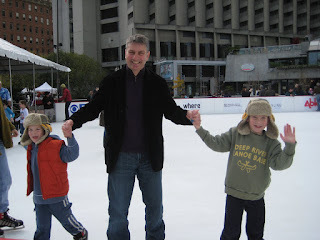 We decided that although it's smaller, that we liked the Union Square rink more because of it's ambiance. The Union Sq rink is surrounded by cafe tables, and cafes, as well as the big tree. The Embacadero rink seemed colder and less lively - although better musical choices. 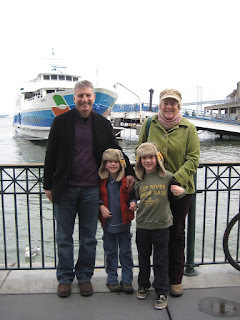 After the skating we went down the the restored Ferry Building to mooch about and get some lunch. We also bought another olive tree from McEvoy Ranch since our previous tree has done so well (more on this another time). If you are an adult in the Bay Area, or, like us the recipients of free tickets (Thanks Jon), then I recommend a visit to the exhibit. It is running until the end of January. I think for those with young children it's hard to do justice to the exhibition with children in tow, and it's not cheap, so for an hour makes an expensive day out. The parts that we were able to see were excellent, and Nigel and I would have happily spent much longer at the exhibition.